What I must remember most is the reality of how flawed this team is. Just as there is a reason I’m blogging for seedyksports.com and cardchronicle.com, instead of crafting long form pieces for serious $$$ for Sports Illustrated, there are reasons why Christen Cunningham, Khwan Fore and Dwayne Sutton started their careers at mid major schools. Why Ryan McMahon didn’t have any other major college scholly offers. Why Malik Williams and Steven Enoch, shackled with inexperience, are still learning their position. I am not being dismissive of any of those guys, or their teammates, who have banded together and overachieved to the unexpected delight of the Red & Black Faithful. Just as I need to accept my imperfections, so must I accept theirs. I must remember that those magic victories, those out of the blue successes over the Tar Heels and Sparty, the essentially inexplicable first 30 minutes against the Blue Devils, are gifts to be savored. But I must also accept the limited abilities of Chris Mack’s first Cardinal squad. Despite last night’s meltdown, and that in the game before in Tallahassee, what this team has accomplished is nothing short of astonishing. Lean into this splendid oddity for perspective. After U of L’s second coulda woulda shoulda giveaway in a row, the Cardinals have moved higher in Ken Pomeroy’s venerated rankings, from 13th to #12. (Computers don’t have eyes, but still . . . ). Louisville should have won both games. Louisville lost both games. But that lack of intestinal fortitude in those specific moments, does not diminish this season’s challenges they have conquered. Again last night I marveled at Duke’s pre-game warm ups. They are significantly different and significantly more focused, more regimented and unique compared with other schools that venture to the Yum!. The Blue Devils are not only tall but long. 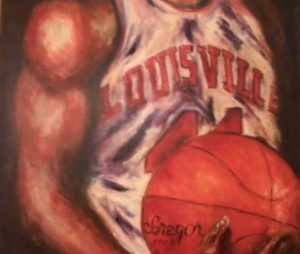 As their press discombobulated the Cards, those arms seemed almost cartoonishly elastic, grabbing too many U of L passes, flicking them from the air like Venus Fly Traps. I walked past former Cardinal pigskinner, long time NFL OL Eric Wood on the way to courtside before the game. He looked like a skinny kid compared to the manchild that is Zion Williamson. All that said, what I noticed during those Duke warmups was how much less intense this gang was than the last two that visited the Ville, and which exited town defeated. Which was on display as the Cardinals took charge of the game. If you’ve ever doubted that Mike Krzyzewski is the best ever, it should have dissipated last night. Of course, his players are much better than U of L’s. But he tweaked his plan and motivated them to that W.
But I do not mean to prevaricate. The University of Louisville Cardinals, the team that I have loved as much as anything else in my many years of breath, spit out the bit. Up 23 with less than ten minutes to the buzzer, the Cardinals were outscored 10-35 the rest of the way. Missed trey. Missed front end of 1+1. Missed layup. Missed jumper. Turnover. Missed three. Missed three. Made three. Turnover. Turnover. Turnover. Turnover. Two FTs. Missed three. Two FTs. Turnover. Turnover. Made trey. Turnover. Turnover. Missed jumper. Ball Game. Gobsmacked by the setback, I — Mr. Verbosity, Mr. Never Fails To Render An Opinion Whether I know What I’m Talking About Or Not, Mr. Always Tries To Tell It Like He Thinks It Is — had no words. Now that I’ve said my piece, it’s time to move on. I’ll be there at High Noon on Saturday to watch this team I care about so much, this team that’s achieved beyond any reasonable expectations, get back on track. It’s beside the point of game, but let me tell you a little story about why the basketball world hates Duke. After the game, as we usually do, we waited in the area to hear Chris Mack’s comments on the big score board. Not a big crowd but a fair number do the same. The Duke fans who were in attendance had by now assembled by the visitor’s tunnel. They were happy. Good for them. Finally, Coach Mack appeared on the screen and began his press conference. As if on cue, the Duke crowd begin to chant over his remarks, “Let’s go Duke. Let’s go Duke.” in a very obvious effort to drown out the PA. They were of course asked to quiet down by the Cards faithful but they kept it up until finally someone from the Duke program waved them off. Duke is a first class school with a first class coach, a first class basketball program and some fans that are just bums. And they wonder why everybody hates them. And I also “have words” about the game and the Cards. I love Coach Mack and his team. They have exceeded all serious expectations. But what we saw at the end of last night’s game was the team we thought we would see all along and if they don’t learn how to handle a zone press, they might not win another game because they will likely see that press every game from here on out. Any coach that doesn’t press them should be fired by his AD. HOWEVER, the team that played the first 30 minutes of that game was a wonder to behold. I’m a fan and I’ll be there Saturday but I will never feel, for the rest of this season, that any lead is safe. I really don’t see how they are going to get past this psychologically.